The Varier Move stops just short of being a leaning chair. While it does encourage active movement, it’s far easier to sit on top of the Move than it is to use it in a leaning position. As always, you’re looking at a trade off – the Move won’t keep you as active as a Mogo or Muvman, but it’s more comfortable than most of its tilt-happy brethren. It’s also made some recent waves as an attention-boosting accessory for the classroom. Attractive and portable, the Move is a fine choice of seat for anyone after an ergonomic task stool. Better-padded than the other stools we’ve seen. Simple, wide-based wobble board allows a greater range of fidgeting movement than the joints common to other active chairs. 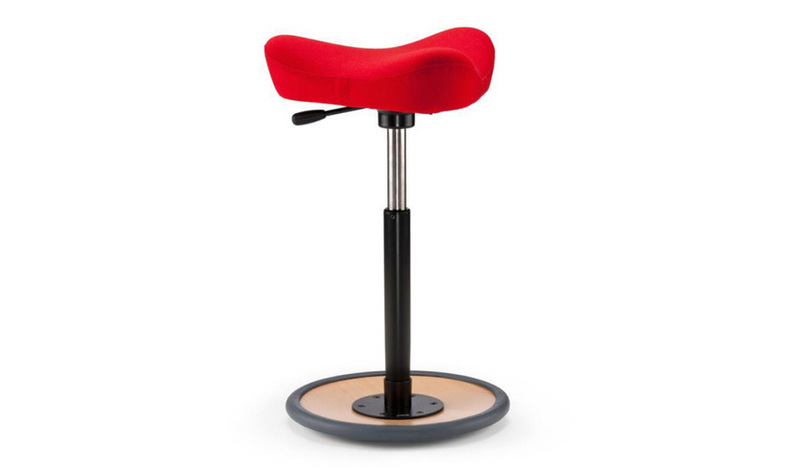 Much more stable than any other stools to date, allowing users to fidget and move while still feeling secure. Less "active" than the other chairs. The three cornered chair forces users further back onto the seat pan, which encourages a more static form of sitting. Some users found the seat fabric grippy and excessively warm. Heavier users (250 lbs) found the cushioning compressed over time, making the seat uncomfortable. If the other leaning chairs we’ve reviewed blend sitting and standing, the Varier Move blends leaning and sitting. A properly used Move takes the majority of your weight, leaving your legs free to fidget. If Varier’s tri-cornered seat seems more heavily padded than other ergonomic chairs, that’s because it is – the Move is designed with some of the cushiness of a traditional office chair. In a full-fledged leaning chair, this feature would be irrelevant at best and detrimental at worst, but with the Varier, it’s a very intelligent design choice. Let’s talk about that seat a little more. It’s a saddle seat, but of a subtly different type than we’ve seen in the past. Saddle seats are very popular inclusions in leaning chairs. These characteristic seats have a raised central ridge, which creates two angled troughs for a user’s legs. They encourage the proper “tripod” position that most leaning chairs shoot for, increasing comfort and leveling off the leaning curve that comes with adapting to a new seat. The best examples of this in other chairs are the tractor-style seat pans used by Focal. Each point of the pirate hat-shaped Move acts as a central saddle contour. Settle into the seat, and place your legs to either side of a ridge of your choice. And where Focal’s seats are subtle, Varier’s are aggressive. The physical geography of the Move resembles nothing so much as a super-sized bicycle seat. The practical effect is to shift a sitter backwards and their legs outwards. It’s a comfortable, ergonomic position – a good splay in the legs improves circulation. One drawback is that it does make the leaning position a little more difficult. A leaning worker generally moves right up to the edge of the seat, then plants their feet, leaving the chair at a sharp angle, supporting them from behind. Sitting right up on the edge of the Move is not recommended. Why? Ever heard of cyclists’ sterility? See these central ridges? Do not spend a workday on the edge of the Move. But don’t let that put you off. 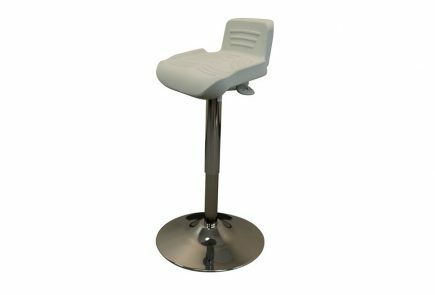 If relative instability is the strength of full-fledged leaning stools, then relative stability is the Move’s main selling point. 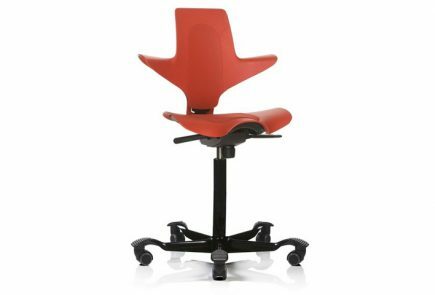 The Move’s base is also geared toward a more static seat than most ergonomic chairs. The wobble board attached to the central pole of the Move might seem like a fully active component at first blush, but that’s not quite the whole story. A close look at that wobble board will show it to have a couple distinct regions. At the absolute bottom is a relatively flat circular area. You’ll notice that a Move left to its own devices will stand straight up and down. An occupied Move will do much the same thing if a user is sitting on top of it and not actively swiveling it about. Tilt forward slightly and you’ll reach the second region, which is more sharply angled, and will roll if prompted. Unlike many similar chairs, the Move doesn’t impart instability on its own; instead, it facilitates a user’s movement. So if you’re after a chair that forces constant motion, then the Move may not be for you. Instead, it’s an option for anyone who needs a stable seat, but also likes the idea of being able to shift about when they get to feeling fidgety. Another Move-specific perk, and one we really, really like, is how easy the chair makes it to reach around an office. One issue with leaning chairs is that they can feel a little precarious – we wouldn’t jump at the chance to swivel in a full circle on the minimalist Mogo. But the Move is a different story. That wide base offers wonderful support, and we had no problems heeling the chair over to snag a stack of papers. The swiveling seat also made it easy to turn for items next to us. But How Do Treadmills Like It? We’ve seen a couple of reviews touting the Move as a treadmill-topper. We like the idea – thanks to its large-footprint base, the Move isn’t about to puncture any belts – but we will offer a caveat. Unlike most leaning stools, the Move supports the majority of a user’s weight, stacking it downward and placing considerable pressure on a treadmill. It’s still a major step up from a standard, pointy-legged chair, but we’d hesitate to call it a perfect solution to treadmill seating. Ah well – the search continues. The Move has recently found itself at home in schools. It turns out that the same qualities that make the Move an ideal movement-enabling task chair also make it an ideal companion to a child struggling with attention deficit, or simply having occasional trouble concentrating in school (a problem that, at last count, just about all kids have). Children in general, especially grade schoolers, are a squirmy bunch, and traditional classroom furniture isn’t built with an eye towards squirm-allowance. Or comfort, for that matter. The Move provides a solution. It works as an outlet for fidgets (a safe, stable one), helping kids concentrate on something other than how pent up and stiff they get after an hour of class. The Move has become a favorite for parents of children dealing with ADD or ADHD. Additionally, some professionals in the field have also supported the use of Moves in classrooms; a recent 2-year study found that children greatly preferred the Move to regular chairs in a classroom context. 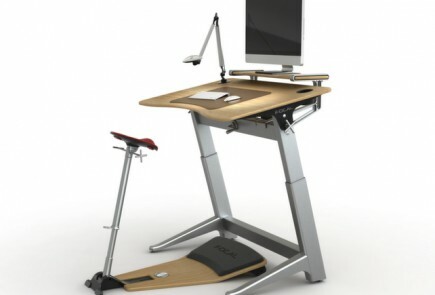 Varier offers three sizes of Move stool. Standard, small, and kid-sized, with each successive size having a smaller seat pan, a shorter central cylinder, and a smaller base. WorkWhileWalking users as light as 160 lbs found the standard size comfortable, but lighter users should consider a downsize. Varier’s warranty covers the wooden base of the Move for 7 years, all mechanical parts for 5 years, and foam and upholstery for 3 years. Read our comprehensive active chair comparison review to compare Varier Move to the top competitors on the active seating market. Sign up for our free newsletter to get updates and new reviews on all products office fitness.